A user journey map (also known as a customer journey map) is a diagram that visually illustrates the user flow through your site, starting with initial contact or discovery, and continuing through the process of engagement into long-term loyalty and advocacy. It identifies key interactions and touchpoints with your website or mobile app and describes in detail the customer’s goals, motivations, and feelings at each step. A user journey map is a visual representation of the customer experience – and is a useful tool for everyone in your company to look at your website from the user’s point of view and can be a key part in user experience design and optimization. The process of mapping their journey encourages and reminds you to consider the entire customer experience: their feelings, questions and needs while they interact with your site. It’s used for understanding and addressing customer needs and pain points. What is the user thinking about and what are they hoping to achieve? This contextual information about the user allows you to view the entire customer experience as a path or journey that begins with having a need and ends with having that need met. It allows everyone to gain empathy for your customer beyond the specific tasks they confront. Understanding the customer’s journey – their feelings, motivations and experiences – can help you design a site that guides them towards meeting their need. It will also help identify functionality that is required from your site, as well as your user interface and website taxonomy. Everyone in your company can benefit from looking at the customer experience through the lens of a user journey map, and help align leaders around the vision of helping to achieve a business goal. Customer journey mapping helps organizations visualize customer interactions over the course of their journey. With a completed journey map in hand, an organization can then orchestrate the ideal customer experience and optimize it for desired outcomes. But there’s no single way to create a great customer experience. This is one reason why mapping the customer journey is so important, prompting an honest assessment into how your buyer persona interacts with your website across multiple touchpoints. A key part of analyzing this customer journey is gathering actual data and behavior. This is where website optimization comes in, helping you learn your customer preferences so you can design your pages with their needs in mind. Optimization will help you identify areas of the site in need of improvement as well as areas where customers are successfully accomplishing their goals. It’s also important that you implement and automate the processes that allow you to continually optimize your customer experience. To continue creating a customer experience that is highly personalized and relevant, you always need to be gathering data and testing assumptions. 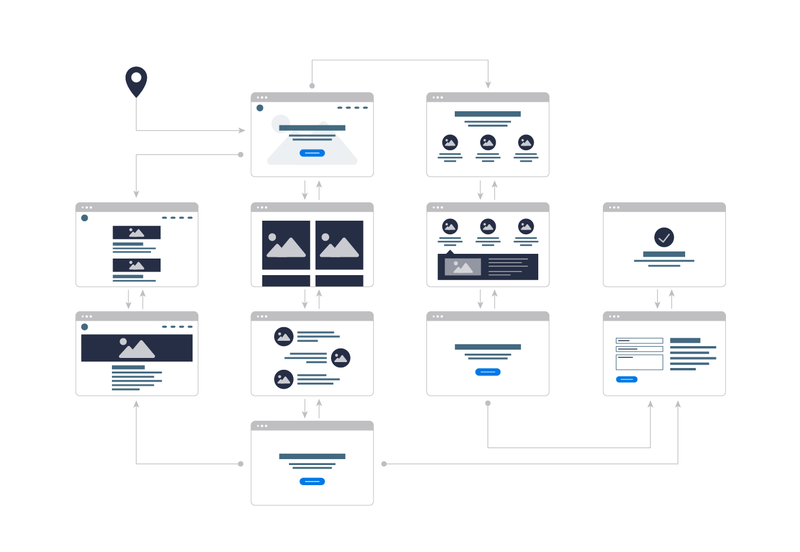 The following is a simplified example of a user journey map that provides a high level overview of the path that a user takes from first arriving on the site to visiting the key touchpoints on the site and eventually converting. This example is a general overview of the typical user journey that can serve as a starting point for understanding how users interact with a site, so that different steps of the journey can be improved. While a simple user journey map such as the one above can be useful for simple sites, more complex analysis could require multiple maps to be created based on specific user personas or analyzing how different traffic behaves based on the source of the visitor (SEO, PPC, social media, etc). Before getting started, you should review and state your business goal, since the journey you provide your customer needs to meets these internal goals. In addition, you will need to rely on user research – both qualitative and quantitative – to inform the process. Quantitative data helps you understand customer pain points, behaviors and actions on your site. Qualitative data is more nuanced, and involves actual observations and one-on-one interviews where you ask your customers directly about their thoughts and feelings at each step of the journey. Your personas are representations of your target customer, and can include such information as age, occupation, location, as well as details like what device they’re on and what task they want to accomplish. You will want to do a user journey map for each of your primary personas. Compile a series of user goals and actions into a timeline of steps on a path that moves in a continuous direction. This represents the experience map. The steps for a typical buyer’s journey are Awareness, Research, Purchase and Use. Within each of those steps exist many touchpoints with your brand. Flesh out the timeline with user thoughts and emotions for each stage based on qualitative research. You will want to include actions, motivations and emotions that occur at each interaction or touchpoint, including the emotional highs and lows, paying attention to where they get stuck or frustrated. Transform your text-based or Excel-based narrative into a visualization of the user journey map (often requiring more advanced design skills). This visual representation is an effective way to illustrate to the rest of the company your key insights into the user’s feelings, motivations and emotions.